As the collision repair industry faces a shortage of qualified technicians, Democratic presidential candidate Hillary Clinton has proposed a $1,500 tax break for every apprentice trained by a business. Regardless of one’s feelings on the candidate, the proposal is worth noting for attempting to fill a need that CARSTAR CEO David Byers called likely “the single biggest issue facing the industry today” during an interview last week. 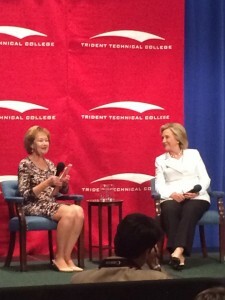 “This is about building our economy from the bottom up,” said Clinton, who discussed the program at a campaign stop June 17 at Trident Technical College in North Charleston, S.C. She said she was “so excited” about the apprenticeship concept, which had a “long history” in America. “If you do your part, then you ought to be able to get ahead,” Clinton said. “It became quickly obvious to me that we had to give our young people and, frankly not-so-young people, the skills and training and education they need either to get off to a good start … or to be able to change jobs and better themselves over the years,” Clinton said. “In order to be eligible for the credit, apprentices would need to be registered, and qualifying apprenticeship programs would have to meet rigorous federal and/or state standards and outcome measures,” the Clinton campaign websites states. The government’s $1,500 in unclaimed taxes would buy an average $6,595 increase in the apprentice’s annual future income, according to Clinton, citing a 2012 Mathematica Policy Research study used by the Department of Labor. “The No. 1 fight that I want to wage and win is making the economy work for everyday Americans, not just those at the top,” Clinton said. Clinton said similar concepts had been floated by U.S Sens. Cory Booker, D-N.J., and Tim Scott, R-S.C., and Maria Cantwell, D-Wash., and Susan Collins, R-Maine. “When employers invest in on the job training, workers are more productive, and businesses are more profitable,” Clinton said. Clinton’s website links the new proposal to her earlier work, including starting Job One at the Clinton Foundation last year. The program targets young people affected by the recession and economic aftermath. “Hillary Clinton’s economic proposals have been light on details and heavy on hypocrisy — another example of why voters overwhelmingly believe she is not honest and trustworthy,” Republican National Committee spokesman Michael Short told CNN.